Metal ear clips are used by veterinarians to identify cattle for health papers, and the normal Official Calfhood Vaccination, (OCV) procedure. These little clips are stabbed through the upper center part of the ear on cattle, and other types of livestock. All veterinarians are taught in college to place these clips in the upper ear. These metal clips are considered as a permanent identification by the federal and state authorities, everywhere. They aren’t. Anything man can pin on a critter, some other man can remove, and even the cattle themselves can remove them. When transporting cattle across state lines OCV vaccinations are required on females to simplify the health certificate process. The OCV vaccination process also includes a tattoo in the inner ear because the founding fathers knew these clips come out. Not only that, most cattle only live to be a few years old, and tattoos often last only a few years. Cattle that don’t have their clips or visible tattoos can be restricted from Canadian import, and may be even refused entry into a joining state. This is quite complicated, and yet is also simple to deal with up front. Texas Longhorns often produce twice as long as regular breeds. The veterinarians who have hunted for inner ear tattoos on 20 year old Longhorns know how hard it is to find an old tattoo. If is isn’t readable, they can’t state that it is. It is then assumed, a non-vaccinate. As a person who has shipped cattle to numerous countries and probably every state, including Alaska and Hawaii, here are two proven solutions. Always have the vet clip the bottom center part of the ear on horned cattle, never the traditional top side. 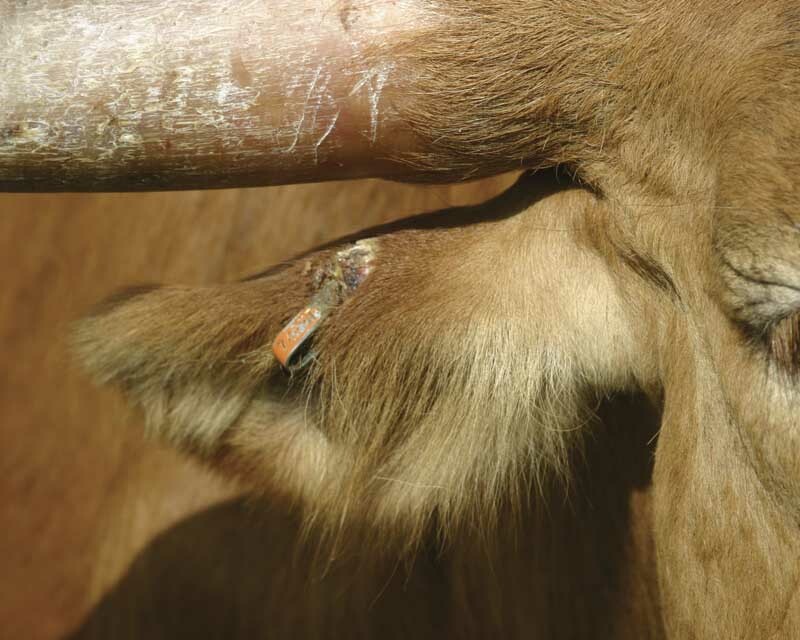 The ear will grow as the calf develops, so leave about a quarter of an inch space inside of the clip for ear expansion. 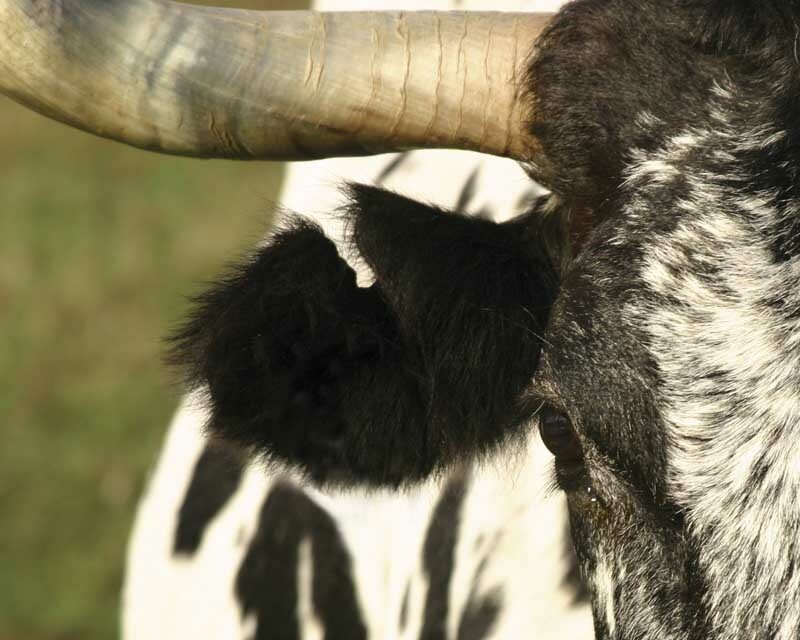 Clips on horned cattle will wear thin as they slide back and forth against the lower side of the horn. Clips can be crushed between a feed bunk and the horn and cause an abscess. All cattle spar with each other so these clips can get crushed in numerous ways. When a clip is crushed it abscesses, becomes infected, and unless promptly removed and treated, will rot out and take a piece of the ear with it. Here are examples of an abscessed ear, and a ear that was mutilated as a result of improper placement. Every horned critter should have all clips attached to the bottom side of the ear, and NEVER the top side. An excellent long term protection is a permanent record of the clip number. The International Texas Longhorn Association provides a space on all registration certificates to record the OCV clip number. If the clip is lost, the tattoo fades, or other records are lost, ITLA documents for ever this lifelong record. The recorded number can always be traced with federal records revealing the date of application, county, state, and owner at time of vaccination. As Texas Longhorn cattle continue to gain prominence, these two precautions will add value, and eliminate a potential problem for every producer.